Spicy Cinnamon Pork ~ Rachel | Losing It! Since moving down South from Pittsburgh, I’ve discovered pulled pork. In NC, that usually means vinegar-based BBQ sauce (which I love). In SC, the BBQ sauce is usually mustard-based (which I also love). In other places, they do a BBQ sauce which is more akin to what people generally think BBQ sauce is..tomato/ketchup based (which I will eat but no longer prefer if I have a choice). This pulled pork, which you make in the crock pot, is none of those. I got this recipe from the blog Fresh Slowcooking which is a great place for crock pot recipes that use fresh ingredients! Anyways, this pulled pork is fabulous over jasmine rice but you could also just serve it with some veggies. I also like it on a bun topped with some cole slaw. Heat oil in pan over medium-high heat. Trim excess fat from the pork and pat it dry (this is important for the browning). Combine garlic and ginger in a small bowl. Rub the mixture all over the pork and reserve any remaining rub. Brown all sides of the pork in the hot skillet…about 4 minutes per side. This step is optional so if you don’t have time for it, just throw everything into the crock pot and run. However, the browning adds a nice flavor so only skip if necessary. Place inside the crock pot and pour rice wine vinegar over it. Sprinkle the remaining spices on top. Wedge the cinnamon stick where it will get moistened by the juices as the pork cooks. Cook on low for 8 hours (or on high for 4 hours). Using two forks, pull the pork. This is one of my favorite recipes and is great if you are having friends over. It also contains ample amounts of cinnamon, my Healing Spice of the week (more on cinnamon in another post later this week). There is also coriander and mustard seeds and ginger and cardamom and cloves and cayenne pepper. Those could probably be their own Healing Spice blog entry (maybe one day). 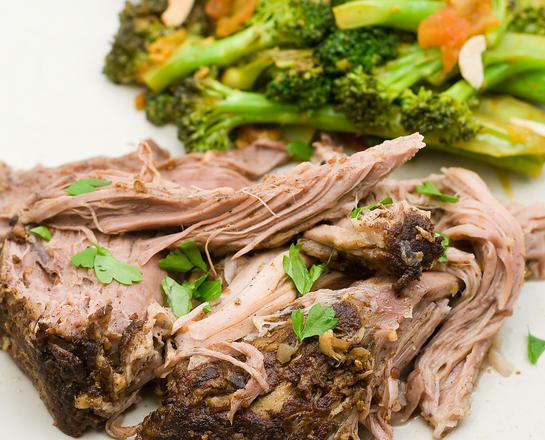 For now, enjoy this pork recipe and come back later this week for the skinny on cinnamon. See, Rachel, the problem with a recipe like this is that I WOULD WA-A-A-AY OVEREAT!! Boy, does this sound good! I have all of the ingredients except the pork which I will buy tomorrow. I am definitely going to make this! Sadly, I no longer have a crock pot, but I do have a wonderful cast iron dutch oven which works pretty much the same way over low heat (even better in the oven, but it is going to be very hot tomorrow and I don’t want to turn it on).